Frequent, rapid headshaking may be a sign pf earmite infestation. Ear mites pose an itchy aggravation for puppies and their people. This parasite also can travel outside of the pup’s body, making it very contagious to other pets in the home. If one pet has ear mites, all of the other dogs, cats, rabbits and ferret friends also need treatment. Your veterinarian can help after diagnosing the mite, but that can get pricey, so it's also helpful to learn how you can medicate your puppy. Here’s how to cut the cost and treat puppy ear mites at home. Treat the ears by flushing away the debris and mites using an insecticide similar to that used in flea treatments. The medication is often suspended in a bland medium, like mineral oil, which when squirted into the ear, helps suffocate the bugs not killed outright by the insecticide. The solution also floats debris out of the ear canal as you gently massage the ear base. A number of commercial products are available for treating ear mites; ask your veterinarian for a recommendation. Holistic veterinarians agree that commercial products work well, though puppies sick with ear mites may have other common health challenges that need treatment. It may be less stressful to shoo away the bugs with more natural treatments and let vet handle the other issues. Cleaning the ears with soothing solutions is the first step. Antiseptic Tea Rinse. Green tea is a natural antiseptic. It can be used to flush out all the ear mite debris—that crumbly brown/black stuff that clogs the puppy’s ear canal. Steep a tablespoon of green tea leaves in a cup of hot water for three or four minutes and then strain it. Let it cool to room temperature before using once a day for a month. Oil Treatment. Oil helps soothe sore ears and also can float debris out. Oil also can suffocate the mites. Holistic vets say it doesn’t really matter what kind of oil you use, although some recommend almond or olive oil. Avoid tea tree oil though, because it can be toxic for cats and smaller pets like young puppies. For the best benefit, crush a couple garlic cloves in a cup of the oil and let it marinate overnight. Garlic naturally kills bacteria that might develop secondary to the mite infection. Remember to remove the garlic before using the oil to treat your puppy’s ears. You’ll need to treat the ears with the oil/garlic solution daily for at least a month. Using a commercial product from your vet or pet store requires you to treat both ears twice a week for at least three weeks. For the natural remedies, however, you need to treat daily for a month. That’s because eggs will continue to hatch for at least that time and can quickly re-infest the ears. The vet may recommend steroid medications to soothe inflammation or antibiotic ointment to treat secondary bacterial infections. The technique is the same whether you use a commercial or homemade solution. Wear old clothes. You’re liable to get the tea, oil or commercial product all over you when the puppy shakes his head. Gather your supplies. You’ll need the medicine, an applicator, clean cloth, and treats. Commercial products come in squirt bottles. For homemade products, you can use an eye dropper or squirt bottle—or try a travel-size toiletry bottle for convenience. A clean dry washcloth helps clean off excess medicine after the treatment. Set small pups on a table or counter next to the supplies; kneel beside larger pups. An extra set of hands can be helpful to keep a junior pup from wiggling away. Pet your puppy, rub his itchy ears and speak in a matter of fact voice. Baby talk or “poor thing” types of language can cue him the experience will be unpleasant and you want him to take the treatment in stride. Firmly grasp the pinna (ear flap) with your left hand to expose the opening and keep the pup from shaking his head too soon. It works best to clean out all the goop before applying the ear medicine, otherwise, the waxy material might protect the ear mites. Use the tea solution first, and then follow up with the oily medication. Drip several drops of the liquid into the pup’s ear. The dog’s ear canal is shaped like an “L” and travels down and then inward toward the center of his head. Don’t poke anything into the ears; just drip and let gravity move the liquid where it needs to go; otherwise, you risk hurting the eardrum and damaging the pup’s hearing. Massage the base of the medicated ear. It should sound a bit squishy as the liquid moves inside and loosens the debris. When the ears aren’t too sore, puppies like the ear-rubbing massage and will lean into your hand with moans of enjoyment because it helps sooth that deep-seated itch. Let go of the pup’s ear and duck as he shakes his head and the debris flies out. Wipe the parts of the ear you can see with the cloth. You may need to do a second application to get all the goop. Feed a treat to your puppy for putting up with the treatment. Repeat on the other ear. Your puppy will look a bit oily for the duration. 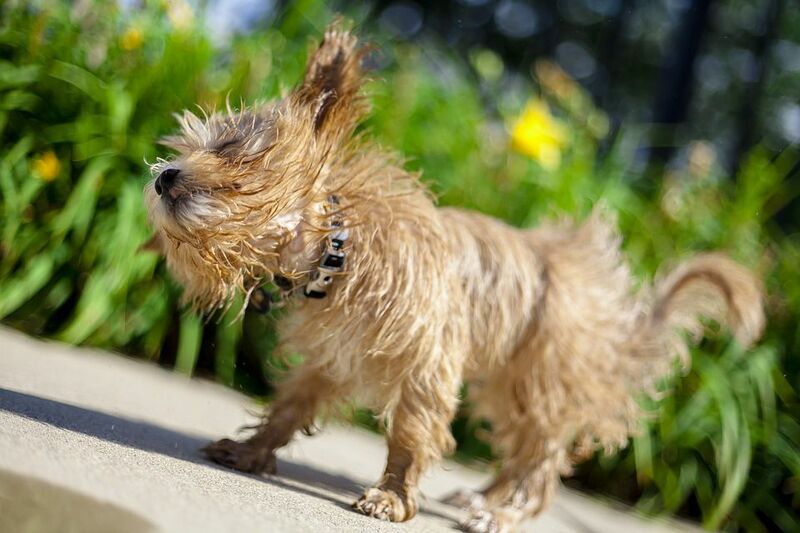 To cure that "wet head" look, a puppy bath may be called for at the end of the month-long treatment.